Old Brods' Callum Thompson in action against Bradford Salem. Picture: John Ketteringham. Old Brodleians will need to up their game considerably if they are to avoid their win-less run being extended to four games away to Yorkshire One table-toppers Bradford and Bingley on Saturday. 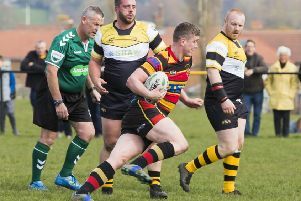 The Brods were beaten 20-19 at home by the Bees’ city rivals Bradford Salem last weekend with Saturday’s trip to Wagon Lane looking far more difficult. Coach Matt Smith missed last week’s second-half horror show, when the Woodhead men threw away a 19-3 interval lead with some tame tackling. “If we had got the first try in the second half that would have been it,” said assistant Danny Monk. Monk praised the efforts of Callum Thompson, Lee Scrimshaw and captain Liam Scott but felt other players had failed to step up. Powerful youngster Alex Dawson played his final game before heading off to Australia. Open side flanker Bob Sykes and No 8 Ollie Akroyd are both missing this weekend so Brods have gaps to plug in the back row and will miss Sykes in the lineout.